The problem with the vegan option though is the cream cheese. Classic New York bagels are already vegan and in New York City at least, you can hardly walk down the street without practically tripping over a suitable one. 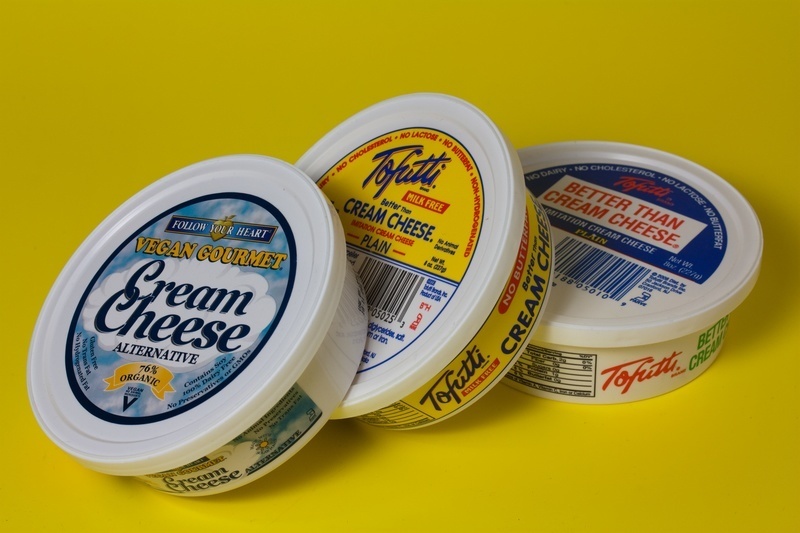 If you’re lucky enough to find vegan cream cheese, it’ll usually be made by Tofutti and contain who knows what along with hydrogenated oils, soy protein isolate, random hydrocolloids and preservatives. I’d wager a bet that this stuff is actually less healthy than traditional cream cheese. There are other vegan cream cheeses on the market but in my opinion most of them just don’t even come close to real cream cheese in flavor and texture. Check out my review of Vegan Cream Cheeses. For years I’ve wanted to develop a vegan cream cheese that stands up to traditional cream cheese in every way and for years I’ve hit stumbling block after stumbling block. The more I began to understand the role of fermentation in foods, the more the puzzle pieces started coming together. Oh and I should mention that this recipe is designed to be taste first, convenience second. Many of the things I post on Veganfoodcraft are recipes and concepts that I’ve decided to take as far as I can in terms of flavor and quality for a possible future food venture. Sometimes I’ll work on something for years and further on down the line realize that it’s not cost prohibitive to go into business marketing, or I’m too scared to take the risk. Many of those recipes end up on Veganfoodcraft so they can benefit the greater vegan community. If you’re looking to make tasty cream cheese in fifteen minutes, this is not the recipe for you. But if you’re interested in the proof of concept, are open to getting my perspective on food and maybe learn a trick or two along the way, read on. A few years ago I realized that fermentation has a truly special and significant place in the world of food development. You can add flavorings and for example, multiple types of acids to foods but they will only get you a fraction as far as true fermentation will in regards to flavor. This is because fermentation can not only produce multiple types of acids, it also produces other compounds such as esters which can create the same flavors found in things like green apples, for example, in addition to practically endless other flavors. That’s why traditional cheese is mind blowing compared to vegan cheese. The world of vegan fermented cheeses is currently in its infancy as of this writing, but I firmly believe that the vegan versions of fermented dairy products will continue to not be taken seriously by the general population until food developers start to understand and respect the complexity of fermentation. This is going to require vegan food entrepreneurs to seriously brush up on food science if they want to be competitive in the marketplace. After all, traditionally fermented dairy products have a thousand year head start or so. I find cream cheese to be odd because it can taste subtly smooth and richly complex at the same time. When analyzing traditional dairy based cream cheese, I often find it difficult to put my finger on what I’m tasting. I decided that my cream cheese was going to have to be fermented to build its subtle flavor profile. This is because traditional cream cheese isn’t tart but it does have a subtle complexity. Let’s take a look at the history of dairy fermentation shall we? Thousands of years ago, people figured out that if dairy milk was left out at room temperature, it got sour. This is because the milk got inhabited by bacteria that were able to figure out how to use the lactose sugar in milk as food. As they reproduced, they created acids such as lactic acid and other flavor compounds. Just as the bacteria took a liking to fermenting the milk, the animal herders took a liking to the flavor and consistency of the milk after it had been thickened and soured. They had no idea this was being caused by bacteria (Louis Pasteur would later prove that it was). 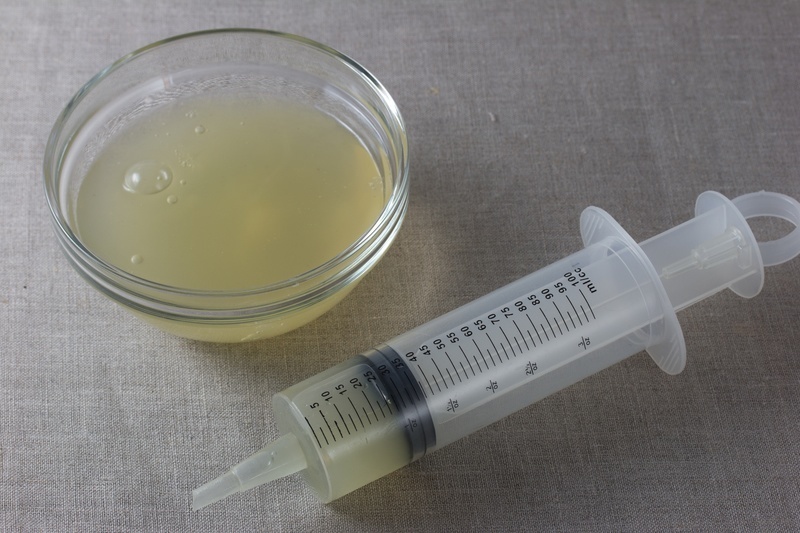 They soon found that if they took a small amount of fermented milk from their current batch they could inoculate the next batch of milk and it would turn thick and sour faster and more reliably. Today, this process is known as backslopping. These cultures are known as lactic acid bacteria, also referred to as the acronym LAB in the food industry. This is because of their propensity to produce lactic acid as a byproduct. Lactic acid is so named because it frequently results from bacteria that feed on milk; lactic means of or relating to milk. This definition is outdated though because lactic acid bacteria are perfectly happy feeding on other sugars such as glucose. Go back to about a hundred years ago when food scientists looked into the individual microbes living in the yogurt and found that in many dairy fermentations, there are usually just a few microbes responsible for most of the flavor and texture characteristics. In cream cheese, other soft cheeses and yogurts, it includes cultures belonging to a group called mesophilic cultures. Meso means middle and philic means loving which refers to how these groups of cultures prefer moderate fermentation temperatures in the 68F (20C) to 120F (49C) range. Mesophilic cultures are responsible for making soft cheeses and traditionally include microbes such as Lactococcus lactis subspecies lactis, Lactococcus lactis subspecies cremoris, Lactococcus lactis subspecies lactis biovar diacetylactis and Leuconostoc mesenteroides subspecies cremoris. The problem with finding a culture to make vegan cream cheese is that all of the starter cultures I could find came from dehydrated dairy-based soft cheeses. These days I usually don’t worry too much about a dairy product that is considerably miniscule, but in my effort to produce a one hundred percent vegan food, I realized I would unfortunately have to avoid a commercially produced cream cheese starter. Luckily, there are yogurt starters that are one hundred percent vegan. Yogurt fermentation also takes advantage of mesophilic cultures that are closely related to the ones that are responsible for cream cheese fermentation. Since cream cheese is very lightly fermented, I didn’t run into issues with the cream cheese being too acidic like there would be in a yogurt that would be fermented for longer periods. Food scientists have found that most flavor development in yogurt is caused by the actions of Lactobacillus delbrueckii subspecies Bulgaricus, Streptococcus Thermophilus and Lactobacillus Casei among others. Lactobacillus delbrueckii subspecies Bulgaricus is named after Bulgaria, the area where it was first isolated in 1905. It works by breaking out amino acids from the milk protein which Streptococcus Thermophilus later utilizes. The byproduct of Lactobacillus delbrueckii subspecies Bulgaricus fermentation is lactic acid and acetaldehyde which is responsible for yogurt’s crisp, tart green apple flavor. This microbe can also metabolize sugars such as lactose, glucose, fructose and mannose. Isolated in 1974, Streptococcus Thermophilus works in tandem with Lactobacillus delbrueckii subspecies Bulgaricus and in addition to utilizing amino acids, is also responsible for breaking down lactose sugar and creating lactic acid as a byproduct. Thermophilus is derived from heat loving, as this microbe is especially heat tolerant. Lactobacillus Casei can metabolize sugars such as lactose, galactose, glucose, fructose, mannose and mannitol while producing lactic acid as a byproduct. The vegan yogurt starter that contains these three microbes is called GI Pro Start. It consists of a cellulose-based powder instead of a powder made from dehydrated dairy products. 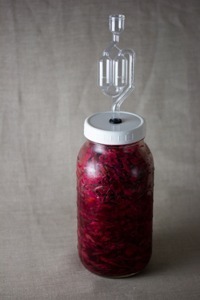 It’s extremely versatile; I use it to ferment everything from yogurt to cheeses. Over the last couple years I’ve been making a serious effort to eat at least three types of fermented foods per day. This often includes a dollop of sauerkraut and a small spoonful of miso mixed into what I happen to be eating. I’ll drizzle wild fermented hot sauce on my burrito or lay a few wild fermented pickles on my tempeh sandwich. During this time, I haven’t had a single stomach issue or cold. I also have considerably less flatulence issues which, if you know me well, is kind of a big deal. Coincidence? I’m not sure, but seeing as how I used to get a cold every four months for most of my life, it does make me wonder. 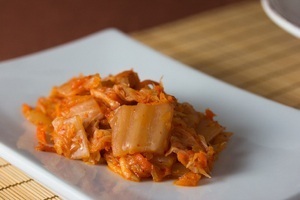 I think I’m going to keep eating multiple fermented foods per day! Health experts talk about the benefits of getting five fruits and vegetables per day. I’ve found that I feel considerably better by not only following that rule, but also by seeking out at least three fermented foods per day. I think this will gain traction as the health benefits of fermented foods are more understood. If you look at what you eat on a daily basis, most of it, even much of the cheeses and yogurts are actually pasteurized, dead food. We’ve only been pasteurizing, sterilizing and zapping our food for about the last fifty year or so. Before that, most of the food we’ve been eating has been alive and teeming with beneficial microbes. Fermented foods have the ability to supercharge the immune response, increase nutrient absorption, protect the stomach from pathogenic microbes, normalize the digestive system and enable the digestive system to more rapidly remove toxins from food. Another benefit of this cream cheese is that since it’s fermented, it is just one more fermented food to add to your health food arsenal. 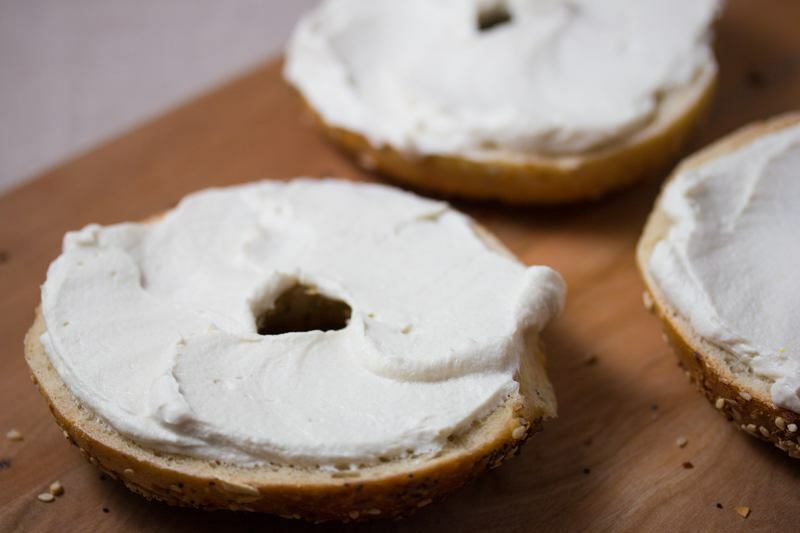 By law, the USDA specifies that cream cheese in the United States must contain at least 33% fat. This vegan cream cheese falls somewhere around that level. Although it’s fermented, it still has a very large amount of fat and calories so it can barely be thought of as a health food. One of the difficulties with replicating dairy-based cream cheese is that it has a subtle savory, almost sweet flavor with a hint of tartness. The texture must be semisolid, smooth and spreadable. 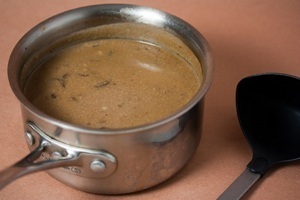 It also must soften slightly when exposed to heat but not melt and drip like butter. This makes it extremely difficult to make a vegan version that can deliver on all of these fronts without resorting to hyperprocessed foods and stabilizers. I realized that I would have to take an involved, unconventional approach to get the results I wanted. Having picked my preferred fermentation bacteria, I then needed to focus on texture. I found that cashews would be suitable due to their slight savoriness. They’re also readily available and easy to use. 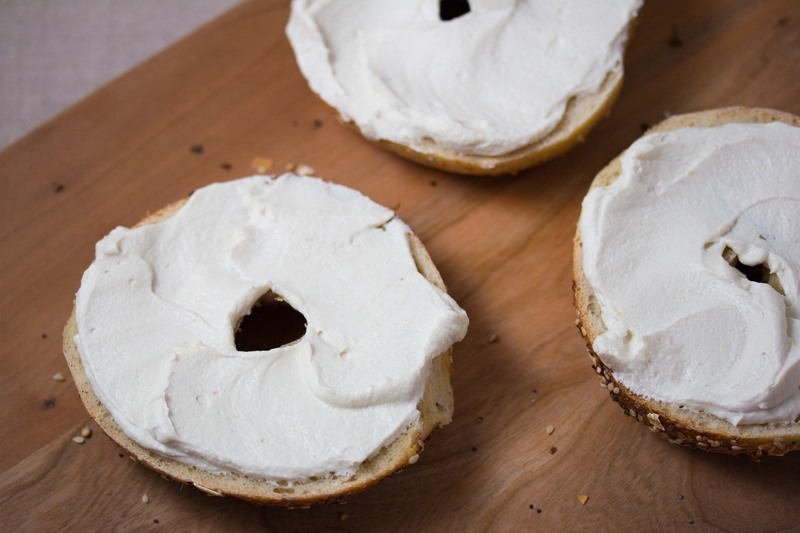 I’d like to make this cream cheese with tofu at some point in the near future though. I highly recommend cooking the cashews to hydrate them instead of soaking. Cooking hydrates as well as sterilizes them so they can be inoculated one hundred percent by the starter culture. If the cashews contained small amounts of pathogenic microbes and were hydrated by long term soaking, there’s a small chance that the pathogenic microbes could theoretically grow in large enough numbers to become a health problem before the designated starter cultures get off to a good start. This can be especially amplified at the higher temperatures in which this cream cheese is fermented. If you choose to use raw, soaked cashews as your base, proceed at your own risk. 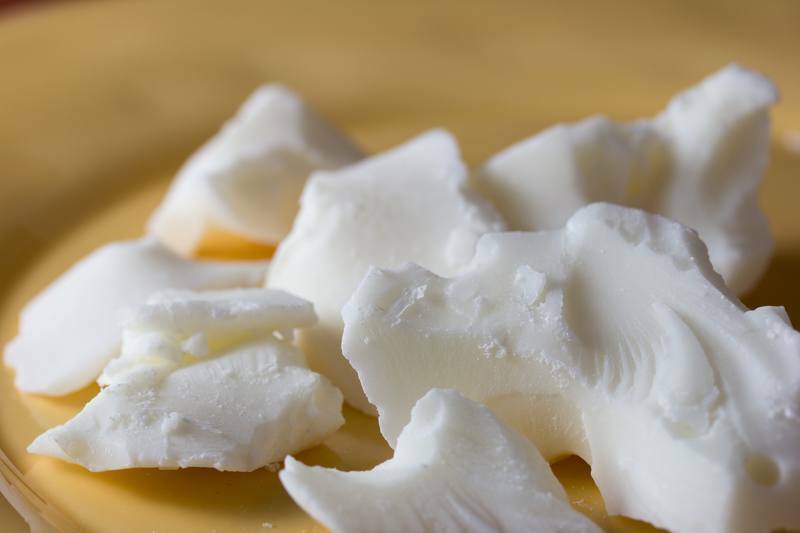 Deodorized aka refined cocoa butter would be ideal as the primary fat because it's neutral tasting and it has a melting temperature in the 93 to 100F (34 to 38C) range which would allow it to soften in a similar way to the milk fat found in traditional dairy-based cream cheese. Coconut oil resulted in a cream cheese that was far too melty due to its lower melting temperature of 77F (25C). Now I had some nice texture attributes but I wasn’t out of the woods yet. I needed a slightly more complex vegetal flavor development which I was able to get by adding a small amount of shallot, bell pepper and switching the salt to Maldon salt which can impart light mineral notes. The issue now was that the lactic acid bacteria produced a flavor that came up a little flat; not the chorus of complexity and harmony you get from a good fermentation. I also needed to make the cream cheese more soft and smooth. Flax gel was the perfect fit here. Flax gel contains starches called polysaccharides that enable its gelatinous texture. This gel is not only great for improving the smooth texture of cream cheese, the polysaccharides also can be utilized by the lactic acid bacteria as food, much like they have evolved to prefer lactose and glucose sugars. In this case, the lactic acid bacteria are probably able to break the starches into smaller sugars to use for a more thriving fermentation and, thus better flavor development. Adding the fax gel to the cream cheese before fermentation resulted in the subtle tart complexity that I wanted, allowed the fat to more easily integrate into the mixture and contributed to a smooth, silky mouthfeel. Feel free to amp up this vegan cream cheese by adding fresh tarragon, parsley, chives or other herbs. Other suitable additions are ingredients that play on the subtle fat and acid profile such as olives, sundried tomatoes or capers. Here is the Everything Bagel recipe I recommend. Prepare the flax gel, cool and set aside. 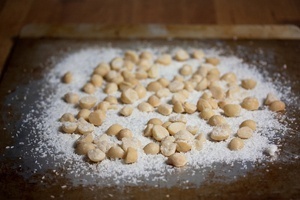 Place the cashews in small saucepan, cover with water and simmer, covered on low heat for 15 minutes. Discard the water. The cashews must now be cooled enough so they can eventually be inoculated with fermentation microbes. Cool the cashews by stirring cold water into the cashews and discarding the water again. You may need to do this a couple times to ensure the cashews have adequately cooled to about room temperature. 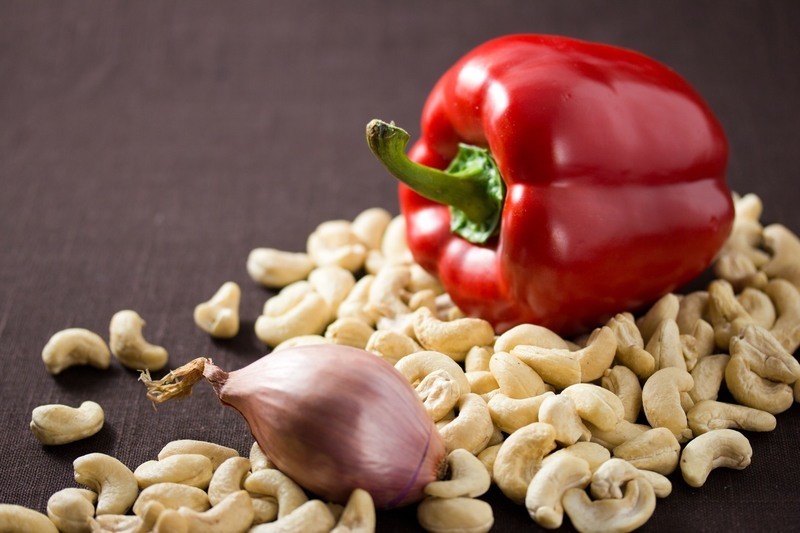 Add the cashews, ½ cup + 3 Tablespoons water, bell pepper, shallot, herbs, if adding, and flax gel to a blender. Blend on the highest setting for 1 minute being extremely careful that the mixture doesn’t heat higher than 110F (43C). Going above about 120F (49C) will kill the yogurt starter as soon as it’s later added which will result in a cream cheese that doesn’t ferment. Use an instant read thermometer to verify temperature periodically to be safe. If you go over 110F (43C), place the blender container in the refrigerator with the lid off to cool back to closer to room temperature. Scrape down the sides and blend for 1 additional minute. The cashew purée should now be smooth with no discernible particles. Place the blender container in the refrigerator and monitor the temperature until it’s below 100F (38C). Add the yogurt starter and quickly blend to just incorporate it. Evenly distribute the mixture to a medium mixing bowl. 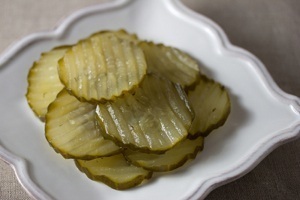 Place a plate on top and ferment the mixture at 115F (46C) for 12 hours. Transfer the fermented cashew purée to a food processor, add the deodorized cocoa butter, sugar, salt and process for 1 minute. Scrape down the sides of the food processor and process for 1 additional minute. Transfer the cream cheese to a container, cover and move it to the refrigerator for about 6 hours so it solidifies to the consistency of traditional cream cheese. Store it in the refrigerator for up to 1 month. This recipe makes about 1 cup Vegan Cashew Cream Cheese. Get a price on the Deodorized Cocoa Butter I Recommend at Amazon. Hi! 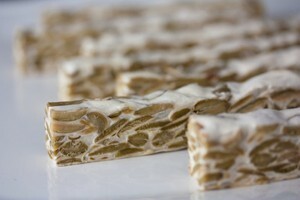 I have made flax gel and am looking forward to making this cream cheese. 1. Is the amount of water 1/4 c. + 3 T or 1/2 c. + 3 T? The ingredients list says 1/4 c. but the directions say 1/2 c.
2. Can this cream cheese be used in cheesecake? If so, do you need to eliminate the pepper and/or shallot? 3. Is the texture more like spreadable cream cheese or block cream cheese? If spreadable, can it be drained to firm up? Hey Mattie, this looks so good. I want to try it right away. I don't have the recommended starter. But you were talking about the LAB as well. I happen to have vegan LAB at home since I wanted to try making cheese with it :-) Is it enough to sub it for the starter, what do you think? I made your recipe but fermented at 110 in my yogurt maker. This is the first non dairy substitute I've had that I liked at all. I even had several people who regularly eat dairy try it and all said it was good. The shallot was more prominent than I would like in a dessert, but on a bagel it was fantastic. I ordered an inexpensive box style fermentation chamber (it's really a bread proofer but goes to 120 for yogurt and cheese) and plan on trying again at 115. Do you think the shallot will be more mellow at a higher fermentation temperature? Or should I skip onion for use in sweet applications? The savory aspect of my batch worked great on my chili and soups. It softened to somewhat of a sour cream consistency. It was lovely and added the flavor profile I've been missing since giving up dairy. Thank you for helping someone with a newly diagnosed dairy allergy regain some flavors I've sorely missed for the last year. I love your depth, perspective, and craftsmanship here! Wonderful. Hi! Thank you so much for posting this! When you say "Blend on the highest setting for 1 minute," are you talking about a high-speed blender, like a Vitamix, or a regular blender? I wonder if a yogurt maker could be used for the fermentation? Hi Doris! I use a Vitamix but my recipes are designed so that blending times take into account blending with a regular blender. In my experiences, lactic acid bacteria tend to produce tastier flavors with non-dairy substrates when pushed to their temperature limits, such as 115F (and not over 120F). I don't believe yogurt makers ferment at that high of a temperature. I'm sure it would work well enough if you fermented it for a bit longer, which would partially compensate. Good luck! It looks great. I would like to try it but I have a question - how do you keep the cheese for the period of the 12 hour fermentation in a 46 degree temperature? I saw that you also suggested using vegan yogurt instead of the fermenter. Would that allow me to skip this hurdle, or does it make no change regarding this phase of the recipe? Hi Morane! It's a big challenge keeping temperatures consistent for fermentation. For most of my fermentation experiments I use a mini refrigerator that I modified with temperature controllers and a heating element, effectively making a fermentation chamber. This way, I can dial in specific temperatures and ferment things for days on end if I need to. An easier way would be to take a cooler and place jars of hot water inside of it while monitoring the inside temperature with a thermometer probe. The wire of the thermometer probe would go inside the cooler so you could check the internal temperature throughout the fermentation period without having to open the cooler. Still pretty inconvenient, I know! I think this why there isn't much information on these types of foods. I'll be writing articles on how to make these types of fermentation chambers in the near future. 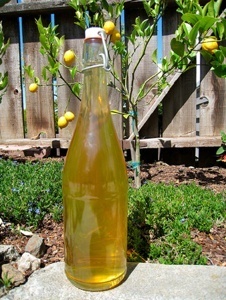 Oh and I haven't tested this recipe with yogurt as the fermentation starter and I wouldn't recommend it. Vegan yogurts usually vast post-apocalyptic expanses of barely functioning microbes (if you're lucky) and thus, don't make good fermentation starters. Good luck! Substitute for gl pro start? Hi, thanks for the recipe. I want to try it, but in my country (Peru) I can't find this yogurt starter, is there any other agent that could be used? Thank you! In order to get the complex flavors of yogurt from these ingredients, we need to introduce a culture of microbes. I prefer GI Pro Start because it's vegan and it tends to work consistently. If you have access to other commercial vegan yogurt, it's probably teeming with enough microbes to be able to start fermenting this cream cheese. To do this, I'd add the yogurt in place of the 1/2 cup + 3 Tablespoons water. Good luck! Can I ask what brand and where you get you Cocoa butter from? Great question Jason. I usually get the cheapest cocoa butter I can find on Amazon that's specified as food grade. I'll add link in the article to make it easier for readers to find. Good luck!